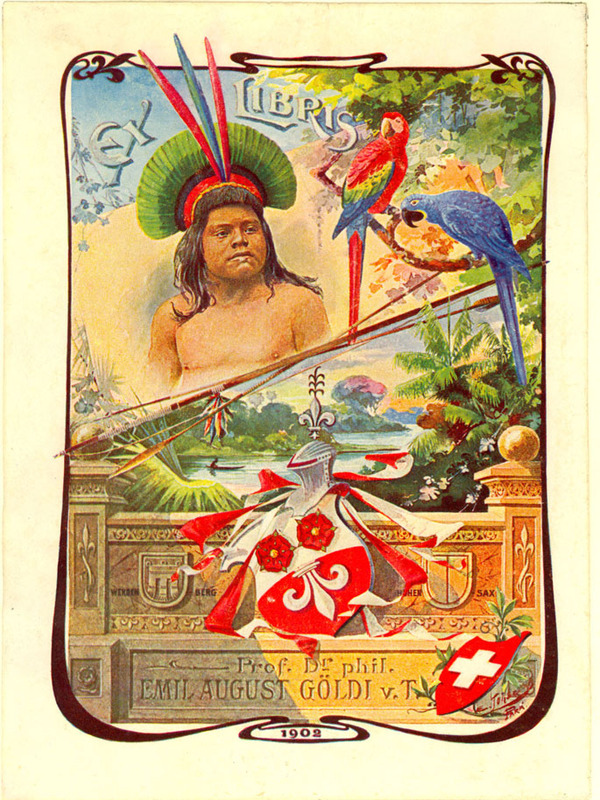 Émil August Göldi (1859-1917), whose colorful bookplate is this week’s feature,was a Swiss-Brazilian zoologist who discovered numerous species of Amazonian wildlife, and researched the causes and prevention of yellow fever. Following a successful research career, Goldi was tasked by the Brazilian government with the founding of a scientific museum in Pará, which still exists today. Göldi’s bookplate, representing his background and various interests, is one of the few color bookplates in our collection. This bookplate is part of the Daniel Butler Fearing collection at Houghton Library. Fearing collected several thousand bookplates related to angling, watercraft, and other related subjects. To access the bookplate collection at Houghton, email houghton_modern AT harvard.edu.